“Beehive” directed by Timothy Stewart is being presented at the Pollard Theatre April 12 through May 4, 2019. “Beehive” is about six young women coming of age during the tumultuous 60’s decade. What a show, what a period of time for those who lived it. In the 1960’s there was a real renaissance of music, attitude, style and growth. We went through a period of the modern pompadour-the beehive hairdo that was the hallmark of the period alongside the miniskirt to an era of the natural look, with love-beads, face paint and the summer of love. The twist, the mashed potato, and many other weird gyrational dances shocked the elder generation. Musically, the San Francisco music scene was happening, and the Fillmore West was the place to go. Woodstock happened on a little farm in upstate New York and the Fillmore East was the place to go and everywhere in between there was dancing in the streets. 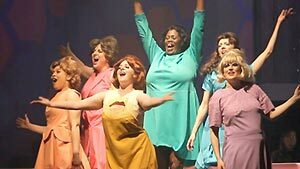 The 1960’s musical “Beehive” chronicles the incredible 60’s decade from the feminine iconic ‘girl groups’ that had such an impact on the music scene and the world. Dusty Springfield, Leslie Gore, Petula Clark, Annette Funicello, Connie Francis and Lulu, The Shirelles and many others filled those early years with an understanding of our angst and our dreams, and the beehive hairdo dominated. The Supremes led by Diana Ross, destined to iconic status from the moment they began to harmonize and our hearts soared as we sang along with all of them. That was the beginning of rock and roll for the little girls of the era who only later understood the roots from which these flowers sprang. Act 1 of “Beehive” has every woman of that era unhesitatingly proud of her age, and the fact that she lived it. These young girls, they burn with jealousy! Gazing with rapture at the stage, as the lyrics of every song fill our hearts again with the silliness of our youth it becomes apparent that these performers may not have lived it but they understand it; connecting with the stars we loved and bringing them back to us. At intermission the ladies room, crowded as usual, is abuzz with chatter and many continue humming the forgotten songs-excited, thrilled and young again. What will be discovered of the late 60’s coming in the second act: and are those experiences one that can be expressed? The songs of Grace Slick, Tina Turner, Aretha Franklin and Janice Joplin are listed as among those being performed. The performers reflect the artists skillfully with every song, and persona down to the eerie glare upon the visage of the Chrome Nun as David Crosby dubbed Grace Slick. Bright pink feather boas and stamping feet adorn the Pearl as Janice Joplin was known. This all takes place on a set straight out of ‘Laugh-In’ designed by the impressive James A. Hughes. And many of the beehive hairdos are the magical creations of Hannah Finnegan giving us the audience spectacular memories of our own rats nest! Act II starts with Tina Turner and, as always, the audience is wowed. The cast has made the transition from teeny-bopper pop to serious rock and roll as easily as the audience once did in their youth. It is said of many icon’s that they broke the mold with this one. They did not. Timothy Stewart directs six very talented ladies to bring these icons to life with accuracy, talent, truth and passion. Susan Riley bridges the gap between scenes with introduction and humor as well as performing magnificently. Riley deftly inserts the silliness teenagers of the period exhibited with the maturity of a reminiscing adult. Her voice is good and her acting is strong. Stef Fortney is as incredible as always, belting out her numbers with conviction and passion. Mariah Warren is outstanding as she embraces each character she portrays in their music as well as their personality. 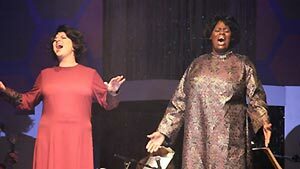 Megan Montgomery superbly envelopes the audience with remarkable intensity in her performance; Jennifer Teel is fantastic in creating a three-way connection between her performance, the performance of each star and the audience. Her skills in singing and acting are exceptional. De’Vin Lewis is spectacular, her vocals are phenomenal in every instance and her command of the music is profound. Accompanying them is the tremendous band led by Musical Director, Louise Goldberg. The musicians also include Jason Hunt, Mary Reynolds and Elyse Angelo, musicians of distinction, all. The chemistry between musicians and vocalists is clear, and a glimpse into the bands space Hughes designed into the set allows us to see Goldberg singing along while pounding the keyboard! Everyone sings along in “Beehive” and everyone dances in their seat, or perhaps, for a brief moment with a cast member! Stewart says that he counts himself lucky to have such a great cast, and they are lucky to have him. Pollard audiences are lucky to have them and the crew to put together the kind of nostalgic extravaganza that lets old hippies relive their youth and gives the youth a chance to experience that renaissance as well. The Pollard Theatre is showing “Beehive” through May 4, 2019. The Pollard is located at 120 W. Harrison in beautiful historic downtown Guthrie. Visit www.thepollard.org or call the box office at 405-282-2800 Tuesday through Friday 10:00 am to 5:00 pm and Saturday 1:00 to 5:00 pm. Curtain for “Beehive” is 8:00 pm Thursday through Saturday with a 2:00 pm Sunday matinee. There is plenty of time to have a good time at “Beehive” and as my husband (who frequented Fillmore West) in the 60’s notes “you don’t have to drink, smoke or drop anything to get a great buzz off this show”!! !